Water damage arises from broken pipes, blocked drains, malfunctioning appliances, storms, fire damage, and other causes. The appropriate treatment depends on the nature of the damage. Some water carries contaminants and should be considered hazardous. Whatever the origin, the prospects for restoration depend largely on the speed with which your building and personal property can be dried. Even clean water can generate mildew and other bacterial growth if neglected. Raw sewage and flood waters contain bacteria and other micro organisms which are extremely hazardous to human health. These can be transmitted by touching contaminated items or by tracking them into uncontaminated areas on shoes. Children and pets are especially vulnerable. Frequent hand washing is an important preventative measure. Absorbant materials such as carpeting and drywall may not be restorable after direct contact with sewage-contaminated or flood-contaminated water. Elite Restoration is leading the way in the water damage clean up business. We have the expertise to get your water removed and your home or business dried out thoroughly and in a timely fashion. Our certified and experienced professionals understand that the last thing you need when your property floods is more stress than you already have. Our team handles your emergency water damage clean up and repairs promptly and professionally, so you can have satisfaction and peace of mind. When disaster strikes, delay in response time can cost thousands of dollars in loss of inventory, property and additional living expenses. Water damaged items become non-salvageable without quick and skilled restoration services, costing thousands of dollars, as a result. Elite Restoration can cut your replacement costs by up to 70%. We accomplish your cost savings by using proper drying techniques that restore soaked structural materials to their original condition. Elite Restoration also works to prevent future moisture problems and protect the unaffected areas from humidity damage.
. Emergency Response – 24 hours a day 7 Days a week 365 days a year.
. Reduce construction repairs by up to 70%.
. Efficient use of time for construction repairs.
. Evaluate and restore water damaged contents.
. Prevent secondary damage to building materials and contents.
. Protect unaffected areas from humidity damage.
. Reduce potential for mold, mildew and bacteria to grow.
. Reduce additional living expenses by providing expedited emergency services. The Elite Restoration team are highly experienced and qualified estimators, field supervisors, and IICRC certified technicians. We evaluate the damage thoroughly and start the restoration process swiftly. When your home or business is drowning, you need to take action fast. You can count on us to respond quickly, bringing with us the equipment to extract the water and start the drying process. We’ll pack the contents from the damaged area, dry the structure, and restore your home or business while cleaning and securing all content items safely in our warehouse during the restoration process. Above all, Elite Restoration goes a step above the rest. Using thermal imaging technology, we identify temperature and moisture behind walls allowing us to guarantee that the structure will be completely dry when we leave and thus eliminating future mold problems down the road. We will do everything we can to return your life back to normal and as soon as possible, as though your water damage emergency never happened. 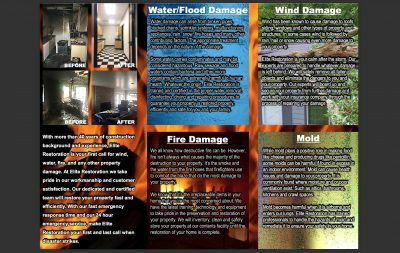 No other emergency water damage repair company in the Magic Valley has more experience, equipment, and training in the science of structural flood and water damage drying than Elite Restoration. Any water damage to your property is stressful and frustrating. In most cases, regardless of the magnitude of the flood, carpet manufacturers void carpet warranties as water damage usually weakens the latex backing on the carpet. However, the main thing to remember is to act fast to contain the damage and start the water cleanup process. Sewage backup damage may be extensive, contaminating your property and possessions, and wrecking your peace of mind. It is vital to act quickly and call a professional restoration company to begin the sewage backup damage clean up process immediately, as there is considerable threats of disease, pathogenic contamination of property and valuables, and possible electrical malfunctions. Elite Restoration has 24/7 emergency response teams that will have the expertise, training, and equipment needed for: sewage backup removal, sewage damage clean up, sewage backup decontamination, and sewage damage restoration. When your water heater leaks, damages worth thousands of dollars can result to your home, furnishings, electric appliances, and personal belongings. It is best to maintain and check your water heater periodically to minimize the potential of water heater overflow. Once your water heater overflows, your goal is to stop the leak as quickly as you can. Water restoration emergencies happen every day. Any water damage situation is stressful and irritating, regardless of the trigger event. When your roof leaks, it may affect your attic, ceiling, walls and floors. Leaky roofs lead to water damage situations and may threaten the structural integrity of your property. As homes and commercial properties sustain water damage following natural disasters, it is important to address the situation as soon as possible with proper water damage restoration. When flood cleanup is not attempted in a reasonable time frame, mold may set in and cause unpleasant and disturbing health symptoms. Each water damage removal and restoration project is unique with its own scenarios, but the universal idea behind successful flood repair jobs is that complete and thorough drying must be achieved before any rebuilding can be attempted.